"By the harvest are symbolized all those things that spiritually nourish a person." (Apocalypse Explained 911:15). 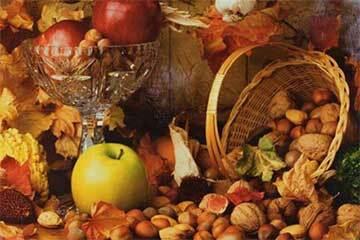 "The feast of the harvest...symbolizes the worship of the Lord and thanksgiving." (Arcana Coelestia 9294). The end of the harvest is a joyful time in all cultures, and for thousands of years people have come together to celebrate and to thank the Lord for the bounty of the earth. But the Lord's gifts are not only those of the natural world; He provides us with what we need to nourish our spirits as well as our bodies. The Lord's love and wisdom are the spiritual food which will sustain us to eternity. And one of the important ways we can open ourselves up to receive the Lord's gifts is by acknowledging that they are, indeed, from Him, and not of our own doing. In this frame of mind, the Lord can flow into us and implant those seeds of truth and good will lead to a heavenly harvest, both in this world and in the life to come.